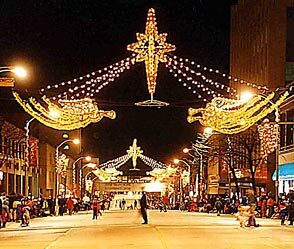 Posted on Dec 11, 2014 by Appleton Downtown Inc.
10. Visit the Farm Market inside City Center any Saturday, 9am-12:30pm. You may be surprised at the amount of fresh produce, meats, cheeses, baked goods and treats in addition to the great gift items. 9. Take a little one to shop at the One Stop Elf Shop next to the Building For Kids Children’s Museum on Saturdays, 10am-2pm. Offering gifts priced between $1 and $10, the help of an elf and design your own gift bags. 8. Try one of the seasonal beers at any of the variety of Nightlife locations. 7. Warm up with a hot seasonal drink at one of the six coffee shops. 6. Be sure to look up at the Angels over the intersections. At night, you really get the “Avenue of the Angels” perspective. 5. Relax and let someone else wait on you as you enjoy a holiday dinner at one of the many casual or fine dining establishments. 4. Buy yourself a little something pretty for the holidays while you are picking out great stocking stuffers! 3. Attend one of the live music concerts, with everything from children’s choirs to national touring performers. Hint: the Mile of Music New Year’s Encore Eve Concert tickets are on sale now (visit www.mileofmusic.com). 2. Enjoy the beautiful window displays daily and the Live Window displays on Dec. 20 from noon-3pm. 1. 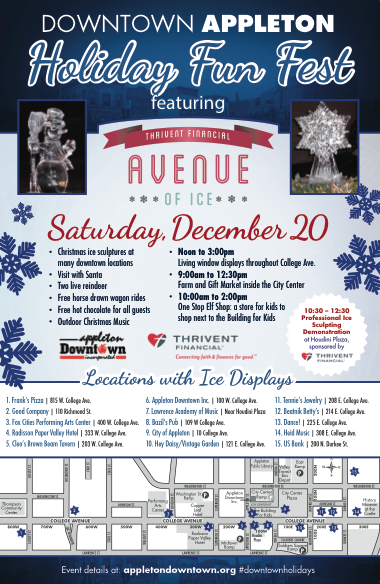 Experience the brand new Holiday Fun Fest and Thrivent Financial Avenue of Ice on Dec. 20. With ice carving demonstrations, live reindeer, horse drawn wagon rides, visits with Santa, music and refreshments in Houdini Plaza from 10:30am-2:30pm and fifteen ice sculptures along the Avenue all day, it is sure to please!